MIT Ventureships Club aims to enhance the startup working experiences of MIT students. Its goal is to help hatch more brilliant MIT ideas into startups and to propel the startup ecosystem evolution at the Institute. The eight startups selected for the Ventureships program included MIT 100K finalists and winners, and over 400 students were engaged. Guided by the Venture Mentoring Service, the Club runs its program every semester, providing great value to both MIT startups and students. In the past year, the programs attracted students from various backgrounds: roughly 30% are from business, finance and management, and 70% are from engineering (primarily Course 1, 2, 3, 6, 7, 10, 16 and 20). About 20% of applicants are undergrads, 5% are post-docs, and the rest are graduate students. The Ventureships Club also expanded its partnership with Microsoft and became a BizSpark Network Partner. Additional partnerships included Angels Global and Xtecher to provide startups with fundraising and PR services. Additionally, the group built strategic collaborations with various student organizations on campus, including the Sloan E&I Club. Ventureships Club was also a speaker and discussant at the MIT Startup Ecosystem Conference last December. With over 940 subscribers on its mailing list, Ventureships Club is working hard to connect and bring the greatest value to founders and students alike. VentureShips offers hands-on training for the next generation of entrepreneurs and business leaders. 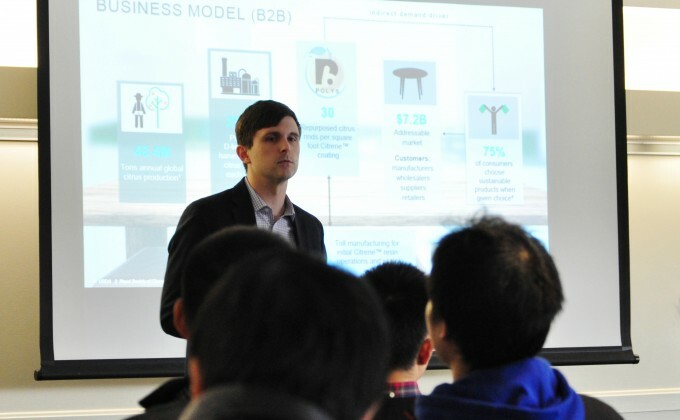 Students work with MIT-affiliated early-stage startup companies on real-life business issues.